The ripple effect of divorce goes beyond the parents and the children directly impacted by divorce. Grandparents are left with questions regarding their future. They are uncertain about continuing relationships with their grandchildren. For more than a quarter of a century, the family law attorneys at Carluzzo Rochkind& Smith, P.C. 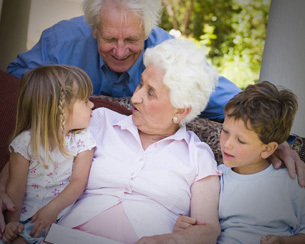 have asserted the rights of grandparents looking to play an ongoing role in the lives of their grandchildren. Protecting the best interests of children is never more important than when one or both of their parents are addicted to drugs, involved with criminal activity, or behaving in a dangerous and unfit manner. While we focus on their well-being and peace of mind, family members, particularly grandparents, serve a pivotal role in providing consistent emotional support. Circumstances exist where grandparents who have legitimate interests in the children can secure custody over natural parents in Virginia. Prevailing in these types of cases presents difficulties that we help our clients overcome in Manassas, Prince William, Manassas Park, Gainesville, Haymarket, Woodbridge, Lake Ridge, Dumfries, Bristow, Warrenton, Centreville, Fairfax, Stafford, Chantilly, Leesburg, Ashburn, Sterling, Herndon, Reston, Alexandria, Annandale, Arlington, and throughout Northern Virginia. We also help grandparents petition courts for visitation with their grandchild. The rules are based on whether one parent or both parents object to a visitation agreement. Both parents objecting will result in the court investigating any potential harm to the child’s health or welfare. From there, the courts will determine if visitation is in the best interests of the children. One parent objecting requires a determination of the child’s best interests as it relates to grandparent visitation. In these cases, we try to get to the specific issues and work out some type of visitation agreement. For more information on grandparents’ rights, call one of our lawyers at 703-361-0776 or fill out our online intake form to schedule a free initial consultation.